Pier 1 Imports (NYS: PIR) reported earnings on April 5. Here are the numbers you need to know. 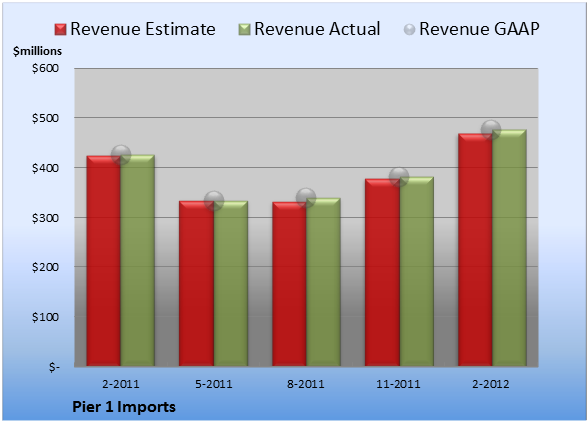 For the quarter ended Feb. 25 (Q4), Pier 1 Imports beat slightly on revenue and missed estimates on earnings per share. Compared to the prior-year quarter, revenue improved and GAAP earnings per share expanded significantly. Pier 1 Imports tallied revenue of $477.0 million. The nine analysts polled by S&P Capital IQ anticipated a top line of $469.9 million on the same basis. GAAP reported sales were 12% higher than the prior-year quarter's $426.6 million. Non-GAAP EPS came in at $0.48. The 10 earnings estimates compiled by S&P Capital IQ forecast $0.49 per share on the same basis. 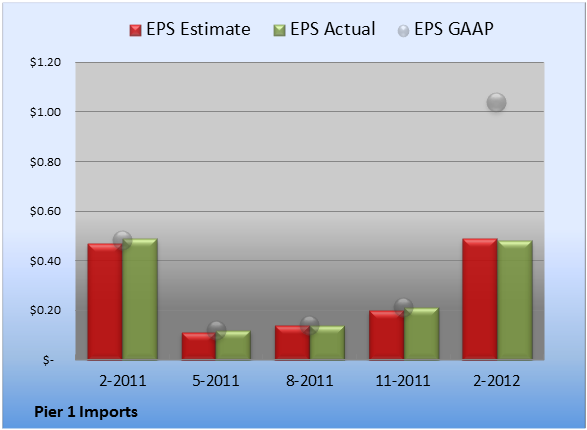 GAAP EPS of $1.04 for Q4 were 117% higher than the prior-year quarter's $0.48 per share. For the quarter, gross margin was 59.5%, 110 basis points better than the prior-year quarter. Operating margin was 16.4%, 260 basis points better than the prior-year quarter. Net margin was 24.2%, 1,080 basis points better than the prior-year quarter. Next quarter's average estimate for revenue is $359.6 million. On the bottom line, the average EPS estimate is $0.16. Next year's average estimate for revenue is $1.66 billion. The average EPS estimate is $1.13. The stock has a one-star rating (out of five) at Motley Fool CAPS, with 253 members out of 569 rating the stock outperform, and 316 members rating it underperform. Among 148 CAPS All-Star picks (recommendations by the highest-ranked CAPS members), 51 give Pier 1 Imports a green thumbs-up, and 97 give it a red thumbs-down. Of Wall Street recommendations tracked by S&P Capital IQ, the average opinion on Pier 1 Imports is outperform, with an average price target of $17.17. If you're invested in retailers like Pier 1 Imports, you should check out The Motley Fool's top stock for 2012. Its founder wrote the book on big-box retailing, and it's growing in increasingly important international markets. Click here for instant access to this free report.